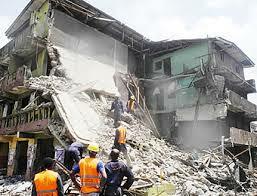 Another Three-Storey Building Collapses In Lagos – Royal Times of Nigeria. Two people are feared dead while fourteen others were rescued alive by emergency respondents today after a three-storey building collapsed on Lagos Island. Report says the incident happened around 7.30am, at Daddy Alaja Street, Oke Arin on Lagos Island. An eyewitness said that the two dead persons, a man and a woman, whose identities could not be confirmed as at the time of filing this report, were pulled out of the debris from the building. It was gathered that the building, housing many occupants, was under renovation when it collapsed. Those with serious ones were taken to the General Hospital on Lagos Island. The spokesman of the Lagos State Police Command, ASP Olarinde Famous-Cole, confirmed the incident. He however, could not ascertain the number of deaths as of press time. Three buildings have collapsed in Ilasamaja, Ebute-Metta and on Lagos Island in the last three months, in which five persons lost their lives while more than forty persons were rescued.